Is it time for Fire Extinguisher Service? There’s no better way to ring in the new year and make sure your business is ready for any emergency 2018 brings than with proper fire extinguisher service at all of your locations. The National Fire Protection Association (NFPA) states that all portable fire extinguishers be inspected on a monthly basis and maintained by a licensed fire protection company on an annual basis. Yet each year nearly 25,000 fires cost companies over billions of dollars from not only recovery of property and premises but worker’s compensation filings and lawsuits from employees. Sometimes damages could have been reduced if employees had been aware of and actually used the fire extinguishers available. Properly working fire extinguishers are a first line of defense against fires and can significantly minimize damage until help can arrive. Total Fire and Safety provides a thorough inspection that begins when we walk in the door, and continues throughout the building. Our fire extinguisher service contains our twelve-point check. What are the 12 points? Visual examination: We ensure the device is free of dents, rust, corrosion, and other related hazards. Test/Maintenance history: We review the test/maintenance history to ensure the internal system is active. Pressure Gauge: We check the pressure gauge to confirm the compression in the tank. Weight: We make sure the right amount of fluid is inside the tank. Discharge hose: We remove it and inspect for irregularities. Locking pin: We check for ease of removal in the event of a disaster. Handle/Lever: We ensure that the handle/pin will discharge smoothly. Clean Extinguisher: We degrease any pertinent areas. Inspection certification: We attach a safety flag and service tag to signify when service was completed. Extinguisher: We return it to the designated location. Mounting Bracket: We secure the extinguisher on its mount correctly. Hazard Application: We confirm you have the proper extinguisher type installed for your application. Hand in hand with having extinguishers is teaching your employees how to use them. That’s why Total Fire & Safety also offers training courses for your employees/tenants so that in the case of an actual emergency, they will not hesitate to reach for the fire extinguisher. Fire extinguishers are not only legally required but also give employees piece of mind, especially if they know how to use them. Employees appreciate working for a company that has their safety in mind. However, fire extinguisher service is definitely key. If your fire extinguishers need service or are due for an inspection, please don’t hesitate to contact us at contact us at 630.960.5060. 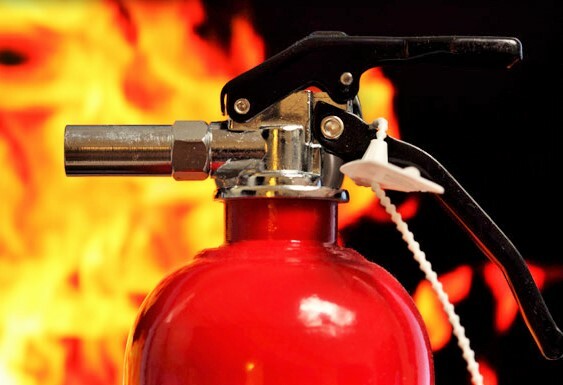 Category: Fire Equipment Inspections, Fire Extinguishers, Fire Extinguishers, Fire Safety Tags: commercial fire safety, Extinguisher, fire and safety equipment, fire equipment inspection, Fire Extinguisher, fire extinguisher inspection, fire safety, fireextinguisher, Fireextinguishertraining | Comments Off on Is it time for Fire Extinguisher Service? Do You Know What Type of Fire Extinguisher Your Business Needs? All fires and fire extinguishers are not created equal. It is important, especially in a commercial setting, that a business has the right kind of fire extinguishers available and ready to go for the most probable fires. Fires are classified five ways (see chart below). While a restaurant may be most concerned with Type K fires, a manufacturing plant may be concerned with B or D.
According to the NFPA, the materials which ignite the most industrial fires are flammable liquids and gases, and electrical wire or insulation. These materials are common in industrial settings, so be sure to follow all fire safety recommendations, and know what kind of fire extinguishers are best to have on hand in the workplace. 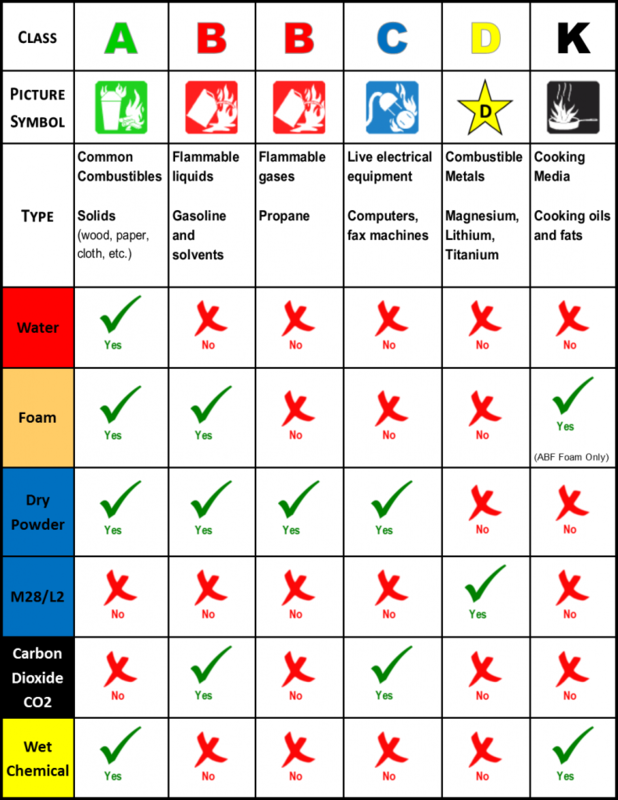 Here is a chart that explains which type of fire extinguishers work for each type of fire. Of these fires, only one (type A) can be extinguished with water. The rest require special ingredients that cut off oxygen in different ways, therefore, it’s important to have the right kind of extinguisher on hand. Category: Fire Extinguishers Tags: Fire Extinguisher, fireextinguisher, Fireextinguishertraining, firesafetytraining | Comments Off on Do You Know What Type of Fire Extinguisher Your Business Needs? We can simulate A, B and C class fires at four difficulty levels and have the capability of grading trainees on their performance. Hundreds of trainees can be trained in a single day without weather restrictions, EPA environmental issues or the mess of using conventional training methods. 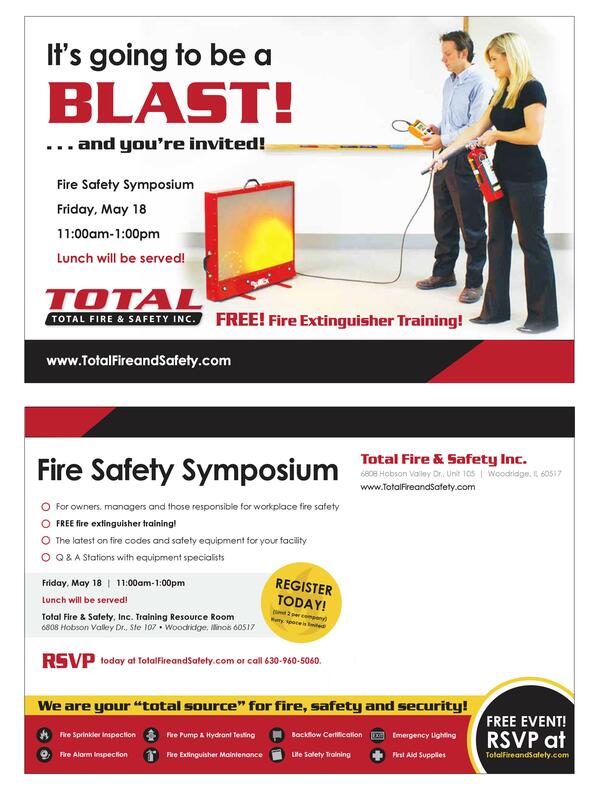 Total Fire & Safety Inc. incorporates the latest technology, utilizing digital flames with laser or water training extinguishers. 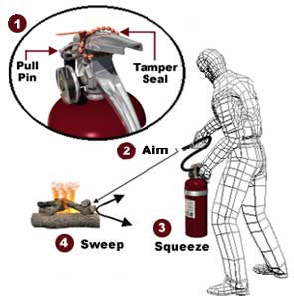 A burn permit is not required while eliminating the hazards associated with conventional fire extinguisher training.